Uxbridge, UK, July 27 2011 - Recent research by global research firm IDC says businesses that tackle five “hidden” costs stand to reduce enterprise printing costs by up to 30 percent, freeing up money to fund other IT projects. 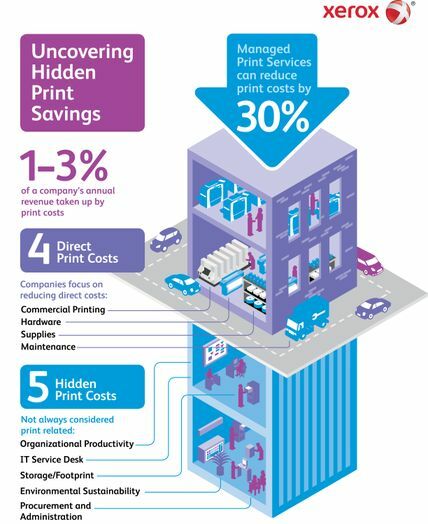 Organisations often focus on reducing direct print costs – commercial printing hardware, maintenance and supplies – which account for only a fraction of the total cost of printing. Also identifying the hidden costs and engaging a professional MPS supplier can reduce overall print expenditure by up to 30 percent, releasing IT budget and time to focus on urgent IT projects. Over 65 attendees including CIOs and IT directors were present at the two half-day events, “Cost Saving and Innovation: How to Deliver Both,” part of the Xerox Real Business Live event series. At the London event, Fred Lynch, client partner, BT, described how as part of the ‘Transform Sandwell’ project, Sandwell Metropolitan Borough Council is reducing its printing costs by up to 30 per cent in a five-year managed print service agreement with Xerox. Transform Sandwell is a 15-year partnership between Sandwell Metropolitan Borough Council and BT to transform front and back office services of the Council including customer services, finance, HR, payroll, procurement. Xerox is a global leader in managed print services placed by Gartner, Inc., in the Leaders Quadrant in the 2010 Magic Quadrant for Managed Print Services Worldwide1. Xerox has also been recognised as a leader in IDC’s Worldwide and U.S. Outsourced Print and Document Services Forecast and Analysis2, IDC’s 2010 MPS MarketScape report3 and Quocirca’s European Vendor “MPS Comes of Age” report, 2010. The London and Manchester events were two of 22 held by Xerox and IDC in 12 countries during May and June this year.